Molly, Sullivan, and Michael Tuttle learned the ropes from their father Jack, who has taught bluegrass music for the past 30 years at Gryphon Stringed Instruments, and plays string bass tonight. AJ grew up listening to a wide range of musical styles, from rock and jazz to country and bluegrass. Her original instrument was ukulele, but now she plays mandolin and fiddle, and sings, continually surprising audiences with a beautiful voice that’s mature beyond the owner’s years. 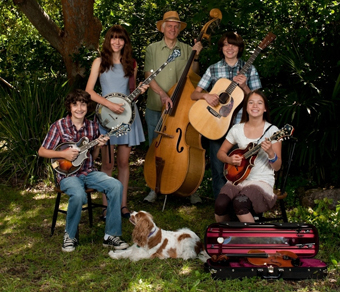 The Tuttles and AJ first met at the 2004 California Bluegrass Association’s famed Father’s Day Festival in Grass Valley, and the excitement of those jams sparked friendships among the young musicians . . . the rest is history in the making! Molly heads for Boston's Berklee College of Music later this month, having won the first Hazel Dickens Memorial Scholarship from the Foundation For Bluegrass Music.